Good Lord. The 29th of March 2019 already. Now we’re into time added on – what in football we used to call injury time – we still don’t have an answer to the most popular question from visitors in the last two and three quarter years – ‘how will Brexit affect you?’ As Brits in France, exporters to the UK from the EU, and as importers in the UK, we’ll put some answers on a postcard in due course, once we’ve got a stronger indication as to where we’re headed. The start of the year might seem like a quiet time yet there is so much to be done. 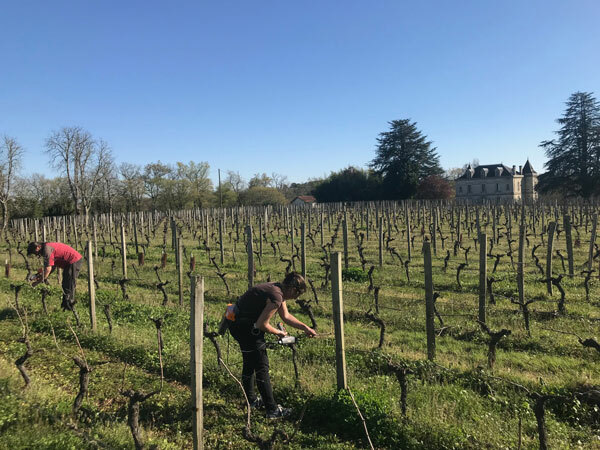 We don’t host tours and tastings at Château Bauduc until April, so we have fewer visitors, but along with the bottling and other important tasks in and around the winery, there’s the winter pruning and preparation of the vines for the season ahead. Here’a an album of pics of the pruning, removal of old branches and the tying down of new ones. I flew to Zürich this week to pour our 2018 Sauvignon Blanc for customers in the tasting room at Selection Schwander. Philipp Schwander was the first Master of Wine in Switzerland and has a remarkably successful business selling wine to private consumers, mainly through mail order. 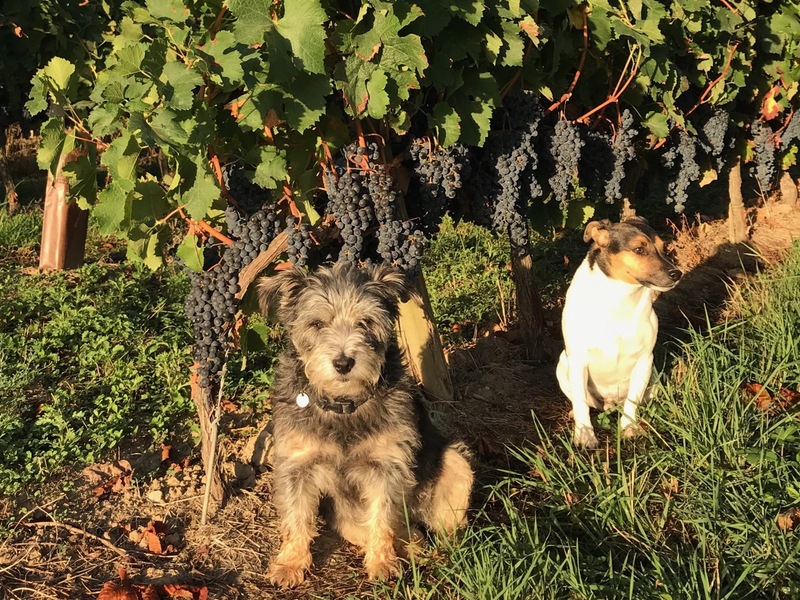 We’ve known Philipp for many years – partly as a result of my somewhat geeky Bordeaux reports – and he’s selected our white for his limited list for the fourth vintage on the trot. In a competitive market, with over 3,700 wine merchants serving the good people of Switzerland, he’s made Bauduc into a popular brand and our Sauvignon is one of his top selling whites. We’re currently exporting more white wine to Switzerland than to the UK right now, thanks to him and clearly a very sophisticated clientele. This article has also been published on JancisRobinson.com and Liv-ex. 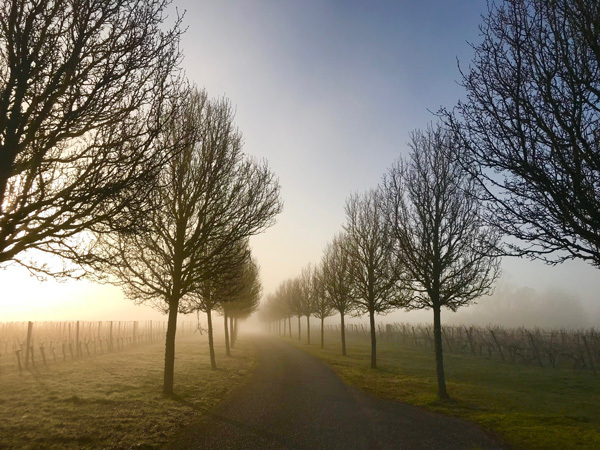 As a backdrop to the en primeur tastings that take place at the end of March and the first week of April, here’s a look at the production figures and a few statistics for the 2018 vintage in Bordeaux. More than that, it’s a fairly in-depth breakdown of how the different appellations contribute to the enormous amount of wine that’s made here, and how recent vintages compare. On the face of it, a year that produced the same amount of wine as the average of the previous 10 years wouldn’t appear to warrant a great deal of scrutiny: the overall figure suggests it’s just an average year, volume wise. As with any vintage, however, the devil’s in the detail and none more so than with Bordeaux 2018, when the equivalent of 666 million bottles were made. (Sorry.) And while it was a glorious year for some growers, and this will be borne out by the tastings, for others the size of their crop was indeed the stuff of nightmares. What a month. 23°C yesterday afternoon here and who’d have thought we’d need refrigerated trucks to transport our stock around in February. Not really, but we have been busy with shifting the new vintages of our wines. The complete series is available for delivery in the UK. 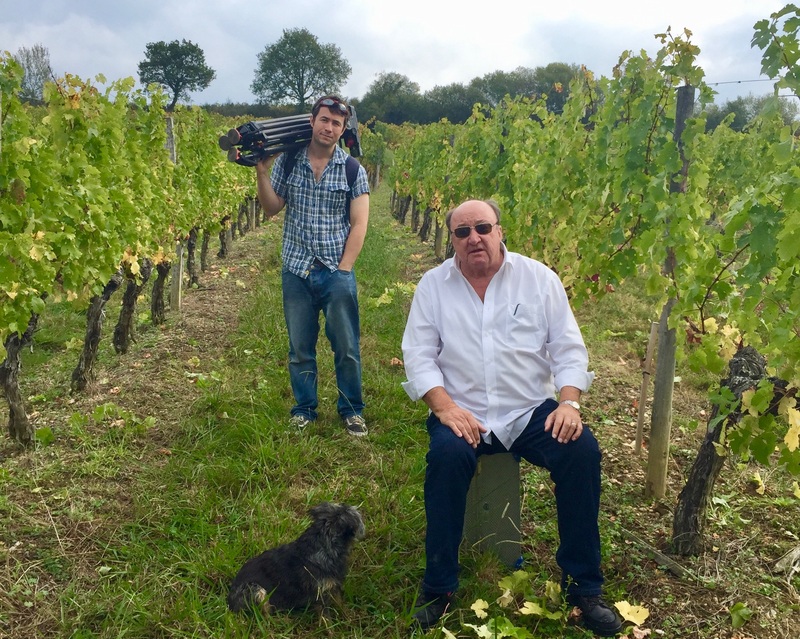 Watching Rick Stein’s Long Weekend in Bordeaux for the umpteenth time when it was repeated earlier this month brought back many happy memories but, on this occasion, it was tinged with considerable sadness. The director and producer David Pritchard, who had worked with Rick for many years, died a few weeks before this showing, following a brave battle with cancer. 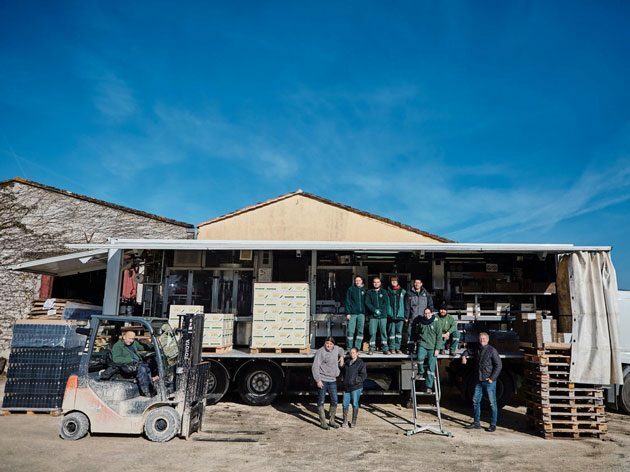 On the face of it, the visit by David, Rick and the production team to Château Bauduc on the last day of our harvest in 2015 had culminated in just a few minutes of TV – albeit primetime BBC. By then though, David and I had become good friends and our friendship would continue, from afar, long after the filming had ended. So here’s a small tribute to the great man, with a gallery of pictures of his reconnaissance trip to Bordeaux, when he was accompanied by his wife and assistant Fiona, and of the filming of the Long Weekend itself with his crew. 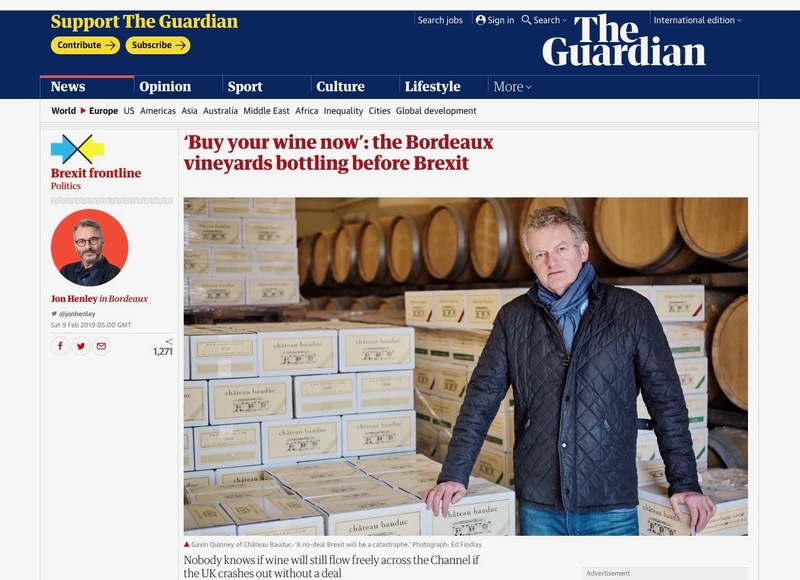 ‘We need a picture of you with the stock you’re planning to sell’ said Jon Henley, the Guardian’s European correspondent, after he came to talk about Bordeaux wine and Brexit. We duly obliged and how smart the online version of his excellent piece looked. Then the picture editor of the print edition called. ‘Not for us, thanks. We need a ‘living the dream’ shot asap – bringing in the harvest, but no posing please.’ That proved more of a challenge than we thought but no doubt you’ll agree that Ange, Georgie and Sophie, below, don’t look like they’re posing. Not one bit. The boss reduced to a miserly cameo role, top right. Sorry to use the ugly b-word in the subject line but we thought we should let you know that we have a plan B and, all being well, this one is deliverable. 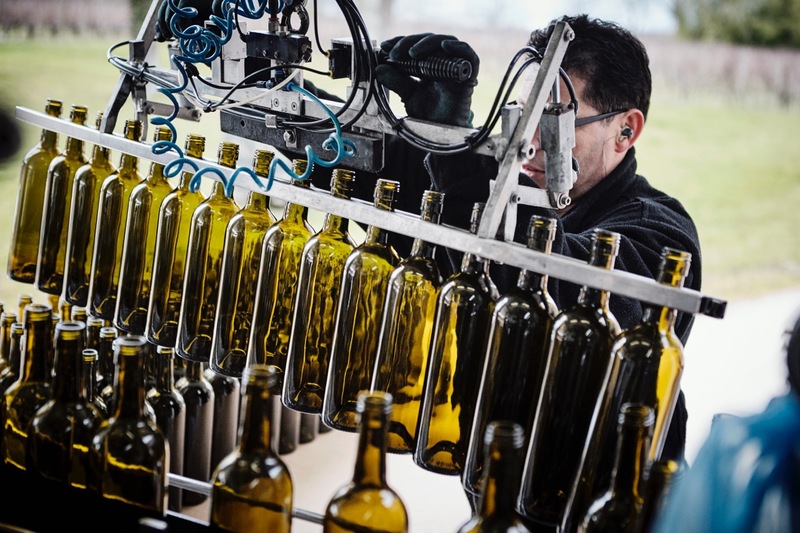 ‘They are bottling early this year at Château Bauduc’ writes Jon Henley in the Guardian early next week, so our plan isn’t quite so cunning that we have to keep it a secret. 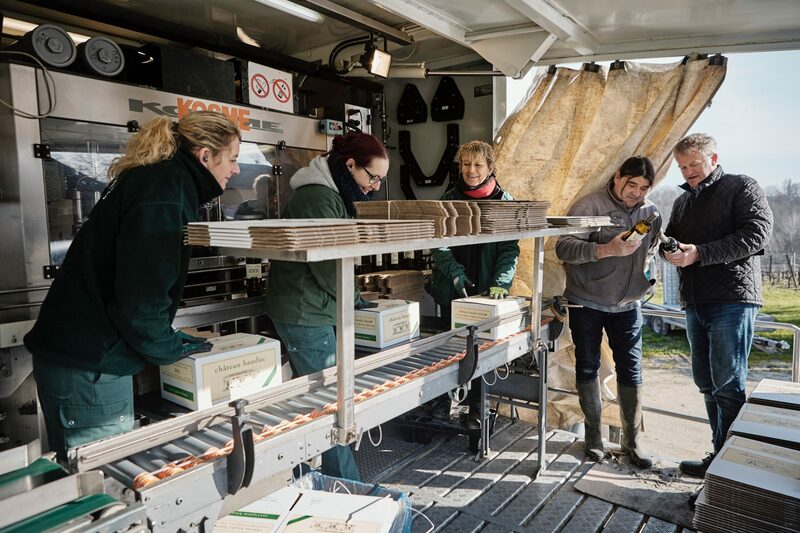 We simply aim to get as much of our new wine over to our bonded warehouse near London before the Ides of March, and a considerable stash to our collection point near Calais much sooner. 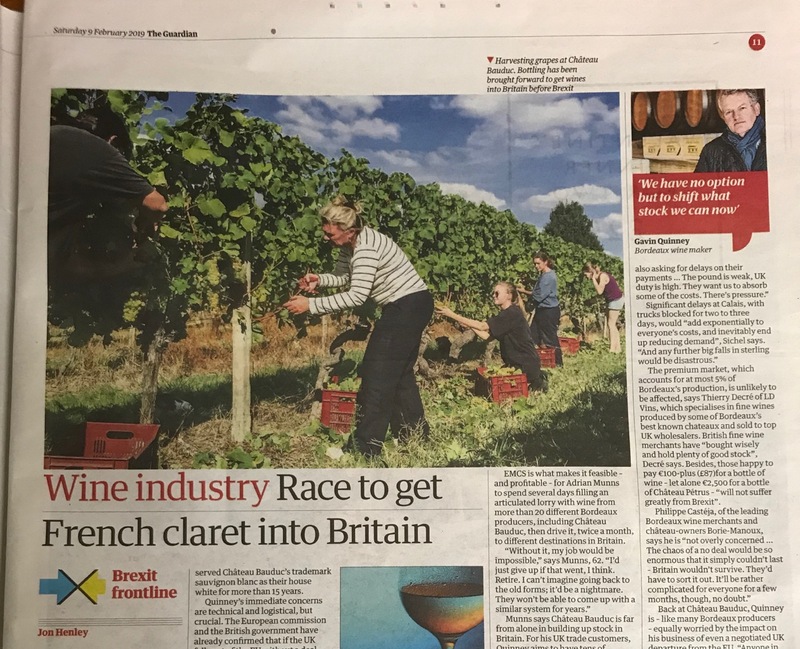 Duty on wine in the UK goes up tomorrow, 1 February. More on that below but it’s one reason our new season offer will include the option of UK delivery or Calais collection – for those that want to swerve the new UK duty rate of £32 for 12, or more than £40 for a dozen sparkling. Everything could turn out fine but, just to be sure, we’re getting a wiggle on.